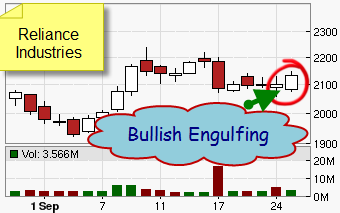 As we had stated yesterday publically on the site that the Reliance stock is going to give money to traders tomorrow and a chart for this Indian Stock Tip was posted on the website on 28 Sep,2009 as a gesture for all those who want to feel the power of technical analysis as provided by the site. Seeing is believing and thus the chart as posted on the website yesterday and as it is showing today; both charts are pasted for quick reference. 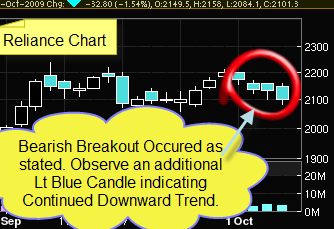 This chart can be also seen by clicking on Indian Stock Market Chart as given with authority on the site. Thus one can see that a site providing authentic technical analysis can help one to make money from the market as one has to understand the way market behaves and for a good technical analyst; charts speaks to him as one pours over it. 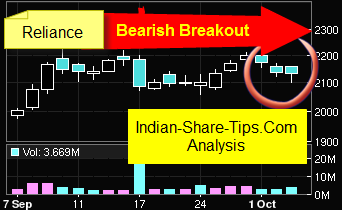 Chart as Shown Yesterday (28 Sep 2009) on Indian-Share-Tips.Com and told free subscribers to go Long in the said stock. Our Subscribers made a lot of money from the stock and if you do not want to be left behind than do consider subscribing for the day trading tips as provided on the site. Our research team again provided a free chart for Reliance on 06 Oct 2009 stating that the same has given a bearish breakout and the chart for the same was posted as a free Indian Share Market Tip and the same chart is again posted here as a proof for the readers to observe the power of correct technical analysis being provided by the site. 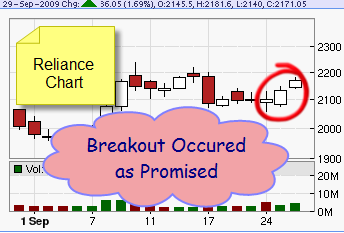 The Proof lies in seeing the results and next day Reliance Chart is pasted below for all to understand that how a correct technical analyst can help you become super rich from the market. The chart for Reliance for 07 Oct 2009 is appended below and one will see an additional black candle and readers made cool money i.e. Rs 4370 from the tip. Thus one will appreciate this fact that trend in a stock reverses constantly and only a stock market expert can catch the same and thus help you all make money from the market. Thus if you want to make money daily from the market day trading, than the proof of our ability lies in front of you and you can consider subscribing for the daily day trading paid calls and same can be done by clicking on below blue button.